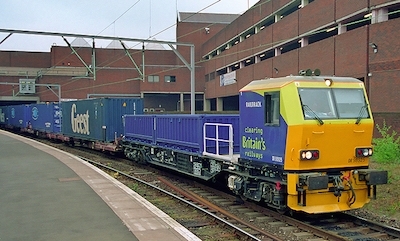 Railfreight operations in Britain have a 12% market share of freight surface transport with an output of 17.8 billion tonne kilometres (btkm’s) in the 2015-16 financial year. This is a considerable decline from the peak of 22.7 btkm’s in 2013-14 when the movement of coal for electricity generation was a significant part of activity amounting to 8.1 btkm’s but this reduced to 2.3 btkm’s in 2015-16. The haulage of coal faces rapid decline as a result of energy policies that levy charges for carbon emission that have made coal fired power stations uneconomic. There are other vulnerable bulk markets as traffics associated with the steel industry reflect reduced production due to a lack of competitiveness in the world market. In a strategic review published on 13th September the UK Department for Transport has recognised there are substantial benefits from moving freight by rail and has estimated that economic and environmental benefits amount to £1.6 billion per annum. Ports and domestic inter-modal traffic continues to offer growth prospects and in a decade haulage has risen from 4.7 to 6.4 btkm’s. The Government expects new traffics to be attracted and there are incentives to do so using the Mode Shift Revenue Support (MSRS) grant which has £83 million allocated in a 5-year budget to 2020. MSRS assists companies with the operating costs associated with running rail transport instead of road, where rail is more expensive. It’s designed to facilitate and support modal shift, generating environmental and wider social benefits from reduced lorry journeys which account for 14% of national carbon pollution. The results of the March 2016 bid round reveal that £17.83 million of funding was agreed for the 2016/17 financial year which covered 41 flows that are provided by five operators Eddie Stobart, GB Railfreight, Freightliner, DB Cargo, and JG Russell. The largest award was worth £2.1 million. It is recognised that to attract more inter-modal traffic investment must continue in capacity to accommodate freight paths alongside the growing demand for passenger services on trunk routes. £235 million is currently being invested in the Strategic Freight Network which will allow faster transits and the ability to carry larger 9ft 6in high boxes over a greater number of routes. The rail product remains restricted to high capacity trains which rules out catering for flows that reach population centres away from the biggest cities. To do this innovation is needed but the potential offered by freight multiple units has yet to be exploited. The use of such vehicles was demonstrated as part of an innovation competition sponsored by the former Strategic Rail Authority and the concept was also successful in a trial for carrying timber traffic which was organised by FCP in Central Wales. An idea discussed to revive freight on secondary routes in Scotland is to create a franchise where the provision of services is specified by Transport Scotland. Self powered vehicles could prove an attractive economic option for such use.